We are offering Acrylic Foam Tape to our client. Roll Length: 6mtr,8mtr,10mtr & 33mtrs etc. Our organization is an applauded name in offering Acrylic Foam Tape to our clients. For preparation of this tape, experts have used best quality acrylic. 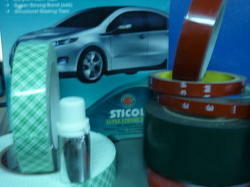 This tape is offered in different sizes to our clients and is prepared by using quality material. This tape has high bonding strength and is free from all types of defects. 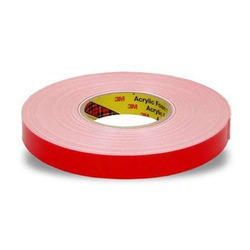 Acrylic Foam Tape provides the convenience and simplicity of a tape fastener and are ideal for use in many interior and exterior bonding applications. In many situations, they can replace rivets, spot welds, liquid adhesives and other permanent fasteners. These tapes are made with acrylic foam which is viscoelastic in nature. The Acrylic Tape offered by us is fabricated using premium quality materials and available in different widths and thickness to enable them for usage in a number of industries. These tapes are used for bonding glass to painted and unpainted metal and are ideal to paste glass to glass, metal to glass and other structural projects. VHB tape is a very conformable, double-sided, pressure-sensitive, closed-cell acrylic foam tape. Highvalley Insulation Pvt. Ltd. (HVIPL) was established by the promoters having more than 25 years experience in the field of various adhesive tapes. HVIPL has established state of the art manufacturing unit at M-16, Sipcot Hitech Electronic Sez, Sriperumbudhur, Kancheepuram , Chennai. VHB Acrylic Foam Tape 4910 is a double-coated 0.040 in. (1.0 mm) pressure sensitive adhesive tape for bonding many painted metals, as well as unpainted metals, higher surface energy plastics and glass. Acrylic Foam Tape is a high performance attachment system for all types of body side moldings and other exterior trim parts. This double coated tape combines high performance acrylic adhesives with viscoelastic acrylic foam cores to create products with unsurpassed initial adhesion, adhesion build, and the ability to dissipate the stresses associated with most automotive applications. Very high bond acrylic tapes create an instant, permanent pressure sensitive bond between a wide variety of substrates such as metals, glass, and plastics. Special grade double sided acrylic foam tapes with different thickness for sandwich application like to hold emblems, logo, panels etc. - Double side acrylic foam tape is recommended for permanent interior and exterior bonding applications. It also has viscoelasticity. - It bonds on contact with no drying time. We are offering Acrylic Foam Tapes to our clients.